June is national Internet Safety Month. Of course we should be mindful of Internet Safety all year long, but this month was designated by the U.S. Senate three years ago to be the official awareness month (not to be confused with National Cyber Security Awareness Month which is October). Review Your Identity Theft Protection Plan– Yes, the deadline for Red Flag Regulations was delayed for some until the end of 2010 but this shouldn’t prevent you from adopting an Identity Theft Protection Plan. Identity theft is still the fastest growing crime and the intent of Red Flag is to help identify, prevent and mitigate instances of identity theft. Conducting an annual review of your Identity Theft Protection Plan ensures you’re meeting compliance requirements and also serves as way to identify potential fraud risks to your business before becoming a victim. 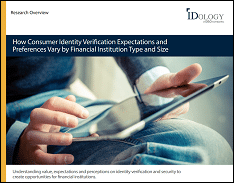 Assess How You Verify Online Consumers – How much personal information do you require from your customers? What’s your identity proofing process? How much manual review are you doing on suspicious activity? How do you authenticate returning customers? These questions are all components of your risk strategy, but more importantly they help define your overall growth potential. You should be using scalable technology that protects both your business and consumers, without hindering the customer experience or hurting overall satisfaction. Promote Internet Safety Month To Your Consumers – Follow the lead of YouTube, Sprint and Comcast and promote Internet Safety Month to your consumers. No matter what size your business is, your customers want to know what you’re doing to protect them. Create an email campaign, e-newsletter or blog post to tell them. June is short so you may not be able to finish all these before the end of Internet Safety Month. But I know you can do it before National Cyber Security Awareness Month rolls around when we’ll have a list of Cyber Security Tips for you!